With an operating pressure of 440 litres per hour, the Stihl RE109 is ideal for cleaning jobs around the house and even in the garden. This 110-bar pressure washer has an aluminum pump head and a stainless steel piston. This construction makes it highly resilient and durable. It is also designed with a quick release coupling on the high-pressure outlet, and this helps to reduce set-up times significantly. Transporting and storing this device is eased by the telescopic handle and the integrated nozzle storage at the hinged front cover. The two wheels make it easier to move around. It is also designed with an induction motor which helps to reduce noise as you carry out your cleaning jobs. As an extra advantage, the induction motor increases the service time of the device. The pressure washer comes with a 7-metre textile mesh hose and a sprayer holder. To keep the various parts safe, you can store them in the accessory holder that is included in the package. The Stihl RE109 Pressure Washer is covered with a 3-year domestic warranty. Rotary Nozzle and Fan Jet – The rotary nozzle provides concentrated pressure, and the fan jet gives variable power output. 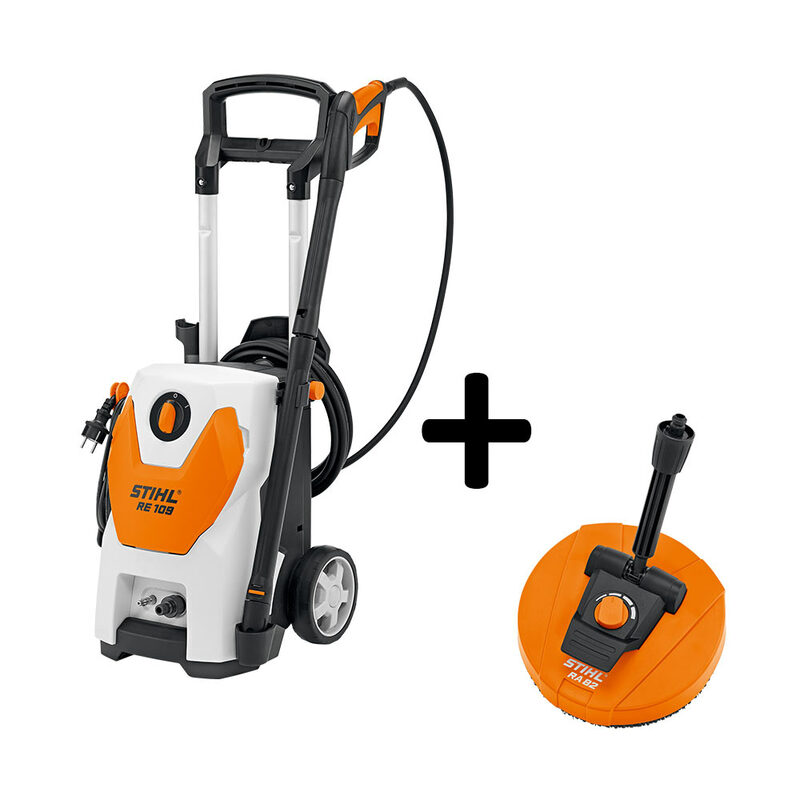 These two features allow you to clean large areas quickly and efficiently. Durable Construction – This equipment is made of stainless steel and aluminum, both of which are strong materials. In case anything breaks, you can take advantage of the 3-year warranty. Telescopic Handle and Hinged Front Cover – The telescopic handle makes it easy to transport the device. The pressure washer has two large wheels for even more comfortable movement. The manufacturer also included a hinged front cover that has integrated nozzle storage. This makes it simple to store the device. Induction Motor – The induction motor reduces the noise produced by the device. This makes your cleaning sessions quiet, in addition to lengthening the life of the pressure washer. Quick Release Coupling – The release couplings on the high-pressure outlet allow you to change nozzles or add attachments quickly. Accessory Holders – The wash brushes, detergents, and hoses can be stored in the accessory holder. Fold-away Front Storage – The fold-away front storage is added for the containment of the spare nozzles. A well designed, efficient and quiet machine for any domestic job.